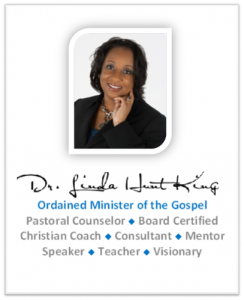 Meet the Founder | Soul Care Ministries International, Inc. | Soul Care Ministries International, Inc.
Dr. Linda King is an Ordained Minister of the Gospel; N.C.C.A. Licensed Clinical Pastoral Counselor (Board Certified), Diplomate and Clinical Supervisor; and AACC Certified Professional Life Coach. She developed a personal relationship with the Lord very early in life and has been active in various ministries in the church (i.e. choir, speaking, teaching, preaching, leadership and pastoral care and counseling) and community since childhood. She answered her called to ministry in the year 2000, was licensed to the Ministry of Counseling in 2001 and was ordained to Ministry of the Gospel in 2003. Dr. King is from Prince George County, VA and daughter of the late Deacon Charlie R. and Mrs. Margaret Hunt. She was raised in a Christian family, the youngest of six children. Dr. King has been nurtured with a love for people; equipped with a rich legacy of ministry planting, teaching, servant- leadership and people-helping; and endowed with gifts of the Spirit for ministry. Dr. King serves on the Board of Directors of SCMi™ as President of the organization and on staff as the Chief Ministry Officer. She discerned her call to the marketplace when she was in junior high school and officially began her studies, in marketing, when God opened that door to her in the 10th grade. She is a veteran Commercial Insurance Underwriting and Risk Management Executive, Career Development and Business Skills Coach, and Mentor who has worked with Fortune 500 companies in VA, MD, DC, PA and GA while serving clients nationally and internationally. Throughout her professional career, Dr. King has served in various volunteer and board positions with numerous trade associations and corporations as well as community-based charitable, faith-based and philanthropic organizations. Dr. King has a passion for ministry in the marketplace. She is also an entrepreneur and founder of a consulting firm that specializes in due diligence consulting. Dr. King currently resides in the Atlanta area and spends most of her time in Atlanta and Richmond. Dr. King is a bi-vocational with a successful 25+ year career in global commercial insurance underwriting, risk management and independent consulting. Most importantly, Dr. King loves the Lord, has a great love for people, is called of God and is an anointed disciple of Jesus Christ and Minister of the Gospel. She has a divine call on her life to ministry and business. Dr. King’s ministry gifting is pastor-teacher while she is talented, and skilled, in business and marketing. Dr. King has a passion for helping people, is shaped with Christ like character, is a servant-leader with a spirit of humility and is spiritually gifted and equipped to serve in this most important area of ministry for such a time as this. To contact Dr. King, or a member of our staff, please click here.